The sun may not have been shining at first this morning but the weather was dry as the first riders cantered down the centre line. As the day progressed, the sun made a welcome appearance and it appeared that everyone was in a good spirits including the judges. Unlike previous years when there had perhaps been suggestion that the judges had maybe been unwilling to offer higher marks on the first day, there was an overall impression of fairness of marks throughout. There was also a good agreement between the judges with almost all riders seeing only a % or two difference between their scores from the judges. Trailblazer Lauren Keiffer produced a solid test but Landmark’s Monte Carlo always struggles to produce work warranting the higher marks, and finished here on a score of 57.3. Mark Todd followed Lauren in to the arena and put down an early bench mark score, for those to follow. The test was lovely and flowing but occasionally saw Leonidas drop sightly behind the contact, but he still picked up a selection of 8s for the better movements resulting in a corrected score of 42.9 which eventually proved good enough for 5th overnight. Badminton first timer Alexander Bragg next entered the arena on the impressive Zagreb, they produced a soft and fluent test but didn’t work fully into the contact at times, instead tending to drop at the poll which would have stopped a number of 7s becoming 8s. They finished on 44.6 but they easily have potential for a sub 40 score at this level in the future. 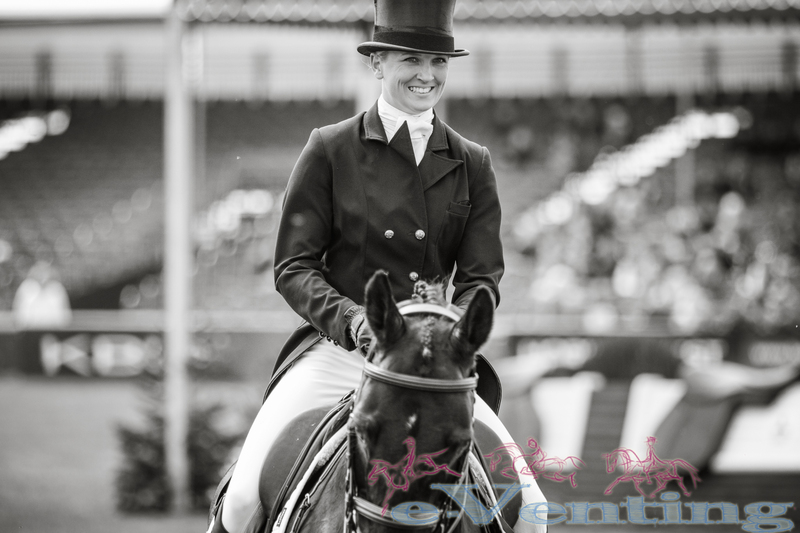 Louise Harwood on Whitson was somewhat frustrated with her test and score of 51.6. The horse is capable of sub 40 scores but was very hot today, jogging in the walk and dropping behind the contact. The atmosphere was clearly affecting several horses with Andrew Hoy’s The Blue Frontier also struggling to settle into its work. Andrew had to ride very tactfully from the start as the horse barely stood still for the first halt. 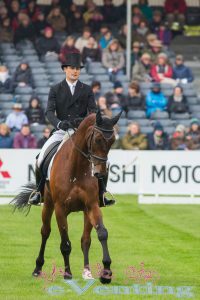 When he settled he produced some lovely work, which was rewarded accordingly by the judges, but a large resistance into canter work marred what could have been a far better test. Andrew explained he had worked him this morning where he was excellent, but he became anxious going into arena. He rightly said it doesn’t matter how well you ride them outside it’s what you do in the arena, and he needs to find a way to deal with it. Ultimately though he doesn’t think it will be dressage competition so was not too disappointed with the score of 60. Another horse to be upset by the atmosphere was Kaapachino ridden by Jesse Campbell. Normally a very capable horse, having scored 41.1 here last year and 36.8 at Luhmuhlen, unfortunately today was not their day. Kaapachino ended up blowing up into the canter, getting close to leaving the arena, and Jesse needed to ride two additional circles to regain his composure. Where the work was good it was very good though, and he was able to salvage a score of 49.9. Oliver Townend’s first ride Samuel Thomas II is in Oliver’s own words a very difficult horse in the dressage as he is not built for the phase. Oliver eeked out every mark for 54.9 and was happy with that score considering the horse’s capabilities. 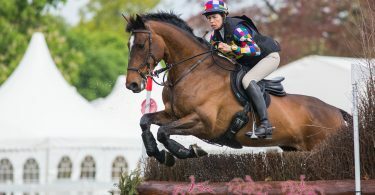 He was another to comment on the belief the cross country course will be very influential, which should suit his horses. After all Samuel Thomas II last year finished 7th at Burghley after a 53.4 dressage. Tina Cook produced a solid test from Calvino although he didn’t produce his best work for a score of 47.2. Speaking after her test Tina explained he is 12 this year but is more like a 10yo currently, with lots of room to improve. His eagerness to please made him tight in the neck today, and then he dried up on her in the test due to his insecurity. With more outings at this level he should grow in confidence and produce the work in the arena he is capable of. Travelling to Badminton with Harbour Pilot on a Land Rover grant, was Hannah Sue Burnett, they could have been a bit more uphill, with more energy at times in the canter, but produced one of the best tests of the morning. His expressive changes earnt 8s and the test as a whole got better as it went along. Hannah explained that Harbour Pilot is a big personality, he loves being at a party as he is a real show off. She was really happy with the test and how he coped with the atmosphere, he did have a couple of mistakes but she can’t fault him on that. She currently sits in equal 8th overnight. 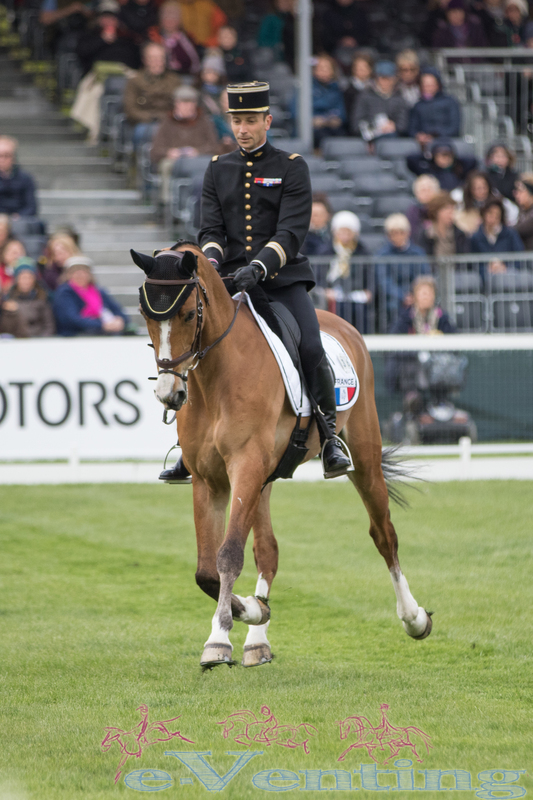 Rio Olympic individual silver medallist Astier Nicolas riding Piaf De B’Neville produced an excellent test after the coffee break. Despite struggling slightly with his collected work, which Astier later explained was age related, which prevented them gaining the higher marks, they were able to move into the lead at that time and now sit in 4th on 41.5. Astier after his test said Piaf is far better in front of a crowd and therefore that allowed him to go for every mark. 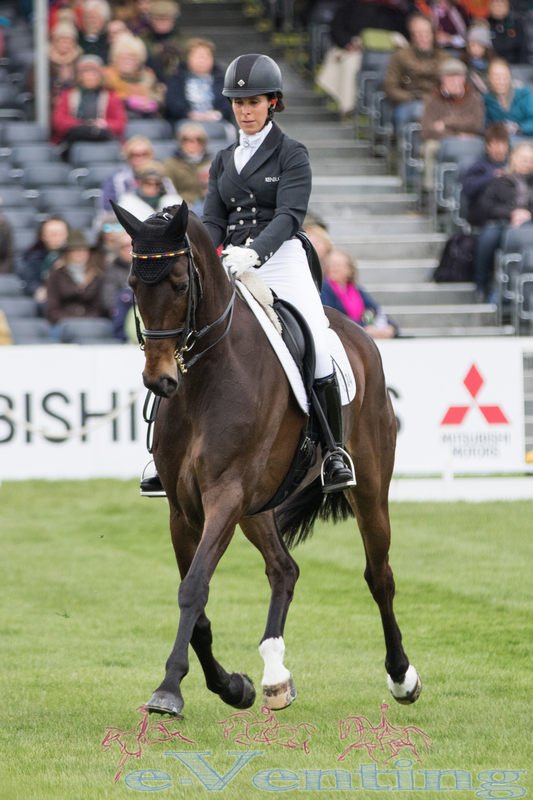 British Badminton first timer Lydia Hannon riding My Royal Touch rode a solid test for 45.1. This was an improvement on her 4* debut score of 50.5 at Luhmuhlen last year and leaves them sitting in 10th place overnight. 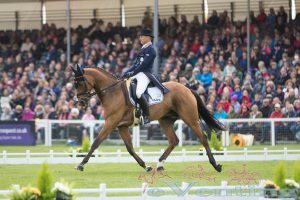 4* first timer Lissa Green was thrilled to be able to ride her test at this her Badminton debut, after getting in from the wait list. She therefore follows in the footsteps of her mum Lucinda Green who still retains the title for the most Badminton Wins. Dressage though is perhaps not Malin Head Clover’s strong point as although obedient and willing he lacked balance especially in his canter where he broke. They finished with a score of 60.2, but with all the riders talking about the strength of Saturday’s track they could well climb up the leaderboard with a sterling jumping performance. 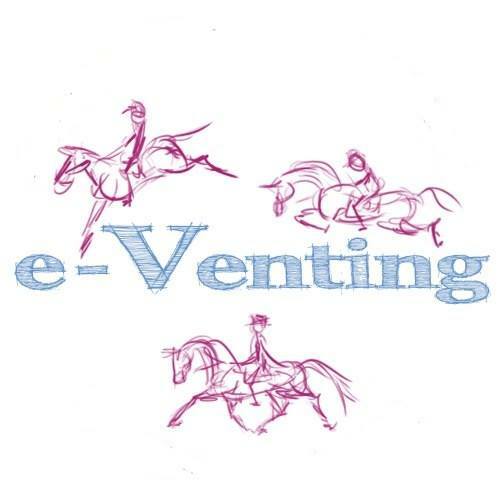 On entering the arena Bettina and Designer 10 were on a mission and once again produced a polished accurate test. Bettina was pleased although felt the changes were a bit tight and she had to contain him within the circles when he wanted to buck! Her score of 39.2 temporarily put her in to the lead but only until Thibaut Vallette entered the arena on Qing Du Briot Ene HN. The pair who finished 13th individually at Rio produced a personal best performance at the level, which was rewarded with a score of 38.7, which couldn’t be beaten today. 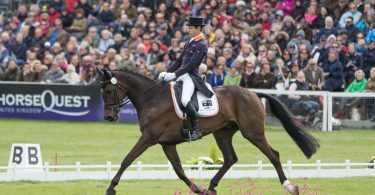 Badminton is Qing’s first 4*, Thibaut was very pleased with the performance and is looking forward to the next few days. Michael Jung and La Biosthetique Sam, who is now 17, produced yet another fantastic test. 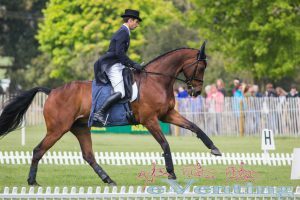 Although Sam lacks the presence of some horses, he is so correct and relaxed and ridden so accurately and beautifully by Michael that the higher marks were awarded, but he couldn’t quite break into the 30s finishing on 40.0 and 3rd overnight. 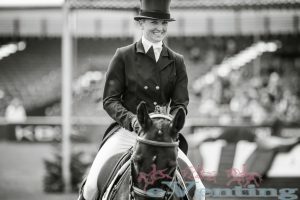 The last session of the afternoon did not supply many changes to the top ten, Rosalind Canter improved on her 2016 score of 45.6 to score 44.9 this time for equal 8th position overnight and Tom McEwen riding Toledo De Kerser produced a lovely test for 44.6 and equal 6th. 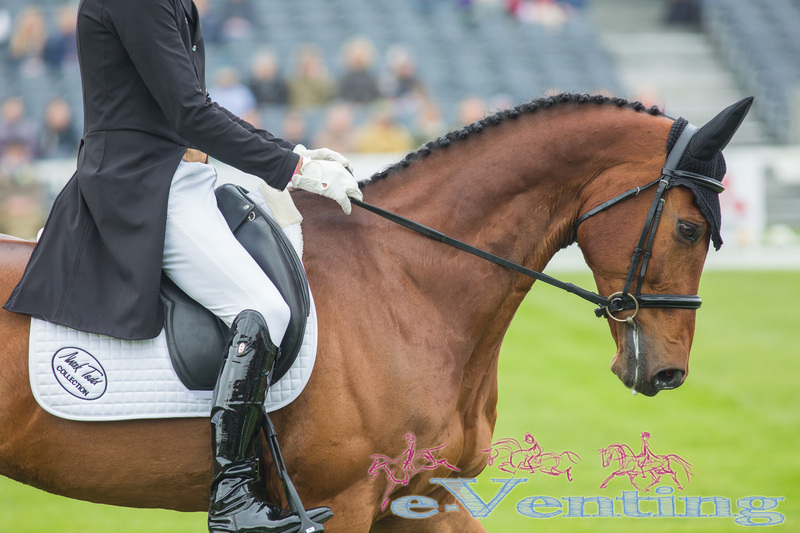 Emily Gilruth produced some excellent work with Topwood Beau to achieve a number of 8s, but mistakes and especially being short in changes were costly, so finishing on a score of 49.7. Emily credits Ruth Edge, who helps her with her dressage, for changing him on the flat. Emily explained he is very sensitive round his ears so was concerned going into the arena with the sun and a number of bugs, that he may start headshaking, she was pleased though that he actually settled quite well on the whole, but although he tried really hard he doesn’t carry himself as well as he could, so was marked down accordingly. Imogen Murray was excited to be at her first Badminton with her 10yo Ivar Gooden. Apparently her Dad was obsessed with stats whilst waiting to see if she would get in off the waitlist, but not being sure if she would get a start helped her, as it meant she didn’t get stressed knowing she was in. She explained Ivar is still green with his changes, this was where she lost a number of marks, especially in the atmosphere of the Badminton arena ,and with dressage not being his favourite phase she had to be happy with her test. Unfortunately Ivar lost a stud before they went in which resulted in him loosing his left hind slipping a few times during test. 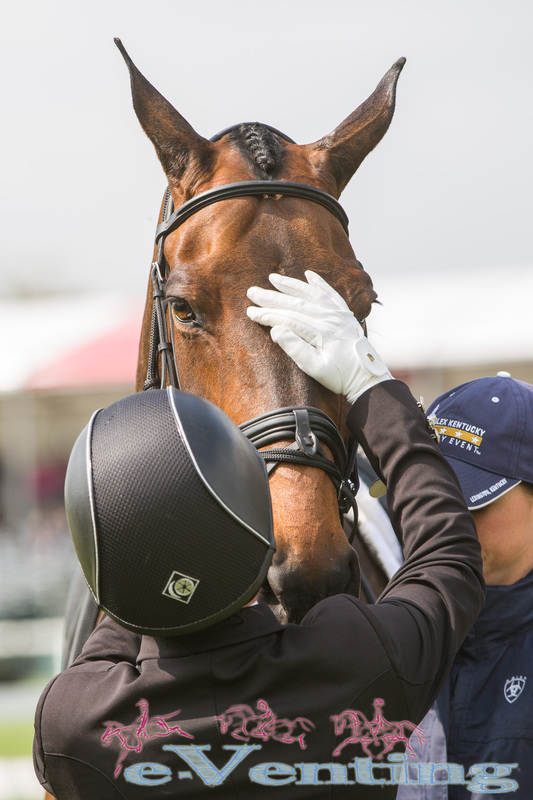 Our coverage from the Mitsubishi Motors Badminton Horse Trials including the Mitsubishi Motors Cup is brought to you by PC Racewear. to read our review on the PC Racewear Elite Jacket Click Here.